Continuing last month’s new tradition – welcome to a review of all that I’ve been up to in February. For a little bit of blog news, I’ve opened up a flickr account for an easy way to share some of my favorite photos with you. I’ve even created a set dedicated to February’s shows, and plan to do the same for each month. February 4th: Is there a better way to set the tone for a month than to start it with the musical force that is Jucifer? Part doom, part noise, and part otherworldly, Jucifer defies definition. They are a two piece band – that you simply have to experience for yourself. You’ll either love them or not – but I hope you will love the experience as I did. This is likely the only time you will ever read these words on this blog: ear plugs are required. After being transferred to the amazing place with Jucifer, it was unthinkable to just go home. Luckily Sin Seven was playing across the street at Ms Newby’s, prolonging a great night out, ending it with a fun group of guys playing some of my favorite hard rock tunes. February 11th: I think I stumbled on one of the neatest, best designed venues in the 850. Brace yourself, it has a silly name. The Lower Alabama Lounge (LA Lounge for short) in Destin is a remarkable venue. The kind of venue that you want to take pictures of and take all your friends to. Even better, they had a night featuring local talent and original songs planned for the crowd. Neutral, Vantage Point, & the helvetica effect all brought down the house. Neutral is a new band with young guys that are working at finding their own sound – somewhat on the indie rock side of things. I believe I over heard someone say that this was their first gig ever, however you wouldn’t have thought that was the case as they looked comfortable on the LA Lounge stage. 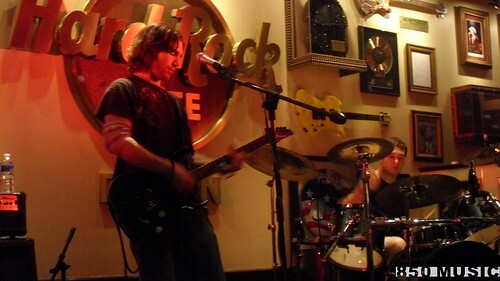 Vantage Point is also a young group of guys, but are on the hard rock spectrum of music. 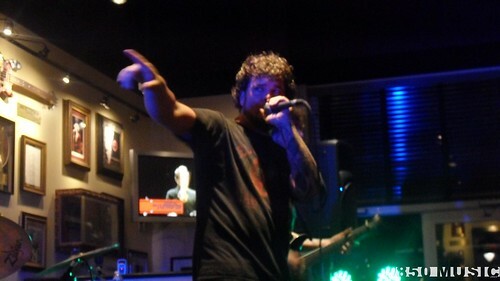 They have a really strong stage presence, and with being part of the Hard Rock Battle of the Bands in no time flat – they are a band to really watch out for. The helvetica effect closed the night with powerful set. They always find a way to not only to meet your expectations, but to surpass them. Each live performance being a bigger event than the one before it. It was also great to see the helvetica effect have room to move around on a bigger stage, and they made great use of it. As a lovely sidenote about the night, there was this great vibe of local bands helping out local bands. That always makes a night more special, feeling like I am seeing the area’s music community coming together to support each other. February 18th: The first round of the Hard Rock Battle of the Bands brought in Faded Saints, Skincrawl, & 13th Shade. I think each band has a corner of the rock world covered. Faded Saints are hard rock, complete with chugging guitars and a vocalist with an unusal range. 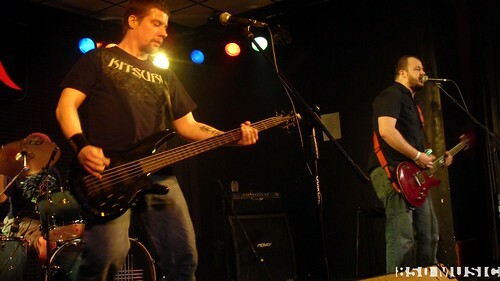 Skincrawl are the metal boys, with lots of energy, powerful vocals, and dueling guitars. And 13th Shade, the winner of the night, are the indie rock 3 piece. They are super polished, really relaxed on stage, and want to make sure you have a good time with them. After the battle wrapped up, it was time to head off to Pandora’s in Grayton to see Hotel Oscar. It may have only been a couple months since I’ve last seen them but they seem tighter and better (if that’s possible) than before. The guys are already working on their 2nd album and played some of the new songs for the crowd, and they were really really good. The band also mixed in more covers than I previously remember being part of their sets, but the covers just further highlight just how good their songs are. February 23rd: Round two of the Hard Rock Battle of the Bands featured For Shame, Hotel Oscar, and Heritage. For Shame started off the night, leaving the stage to interact with the audience, blasting their blistering orignal metal tunes. Then Hotel Oscar took the stage with their unique brand of high energy roots based rock. They put every ounce of themselves into the performance. 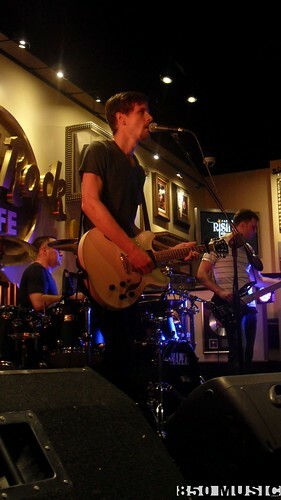 Last was Heritage, the winner of the night, who packed the house with fans and friends. 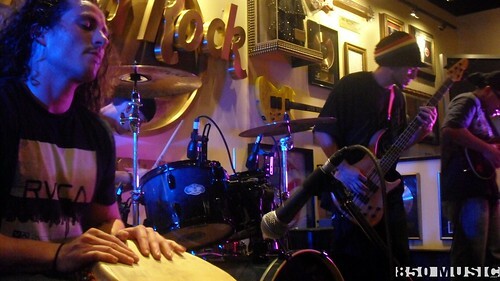 They feature a rock-tinged-reggae style, with relaxed groves and danceable beats. After the battle was wrapped up, it was time to head further into Destin in search of more talented local musicians. The Funky Blues Shack in Destin was the place to be. They have only recently reopened after a really fantastic remodel. The venue has nearly doubled in size, and the stage has grown too. Cozy private booths have been added, complete with TVs that stream a live feed of the stage. So the Funky Blues Shack looks great, but who was playing? 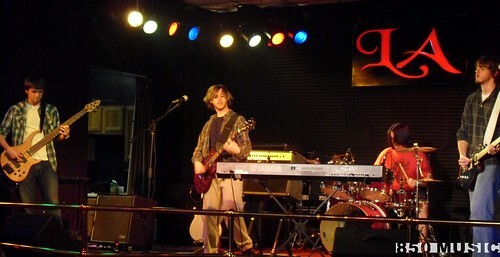 The Forrest Williams Band, recent winner of multiple Beachcomber music awards. They are a three-piece band, drums, keyboard, and Forrest doing double duty on lead vocals and guitar. They played a little bit of everything, with the highlight of the night being Forrest’s original song written about the very venue we were sitting in. February 28th: Third round of the Hard Rock Battle of the Bands featuring The Ayers, Skyview, and Vantage Point. The Ayers feature the only gal to make it into this round of competition – and she is the frontwoman of the band to boot. They put their all into their high energy rock tunes. Skyview – the winners of the night – was up next, with a pure voice and keyboards in the mix, they had a very polished adult alterative feel. Vantage Point brought their game faces, blasting through their hard rock originals, working to win over the crowd. Hello March! Although I wasn’t able to make it to the final round of the Hard Rock Battle of the Bands on March 2nd, I’m sure that 13th Shade, Hertiage, and Skyview put on amazing shows. Heritage was crowned the winner of the night, moving onto the next round, which will be another on-line voting round. In the coming weeks I will be sure to post the details as they are available, together we can help Heritage make it all the way to London. This entry was posted on March 4, 2012 by 850music in Posts and tagged entertainment, Music.